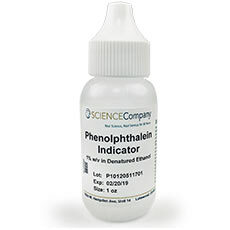 This 30ml (one ounce) bottle of phenolphthalein is commonly used as an acid-base indicator, 8.2 (colorless) - 10 (red). It comes packed in a convenient squeeze bottle for dispensing by the drop. 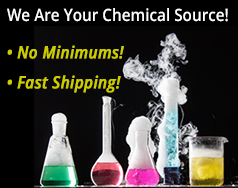 Our Phenolphthalein is regularly stocked and will ship the next business day. Because it has relatively little alcohol content, this one ounce size has no shipping restrictions and can be sent using UPS overnight or 2-day air. What is an acid-base indicator? An acid-base indicator is a weak acid or a weak base. Indicators have a very useful property - they change color depending on the pH of the solution they are in. This color change is not at a fixed pH, but rather, it occurs gradually over a range of pH values. This range is termed the color change interval. Each pH indicator is defined by a useful pH range. For example Phenolphthalein changes from colorless at 8.2 to pink at 10. And Bromthymol Blue has a useful range from 6.0 (yellow) to 7.6 (blue). How are liquid indicators used? Liquid pH indicators are used to test other solutions. A few drops of the right indicator added to an unknown solution can tell you its pH value. Chemists use pH indicators in a common laboratory procedure called titration. Here, an unknown substance is measured by carefully adding a solution of known concentration until a neutral point is reached. The neutral point is indicated by the color change of a pH indicator mixed in with the unknown solution. In schools, phenolphthalein pH indicator is used in a student activity demonstrating first hand how an “infectious agent” is transmitted through a population. Phenolphthalein pH Indicator, 4 oz. Phenolphthalein pH Indicator, 16 oz. o-Cresolphthalein pH Indicator, 1 oz. Bogen's Universal pH Indicator Solution, 4 oz. Bromophenol Blue pH Indicator, 1 oz. Bromophenol Blue pH Indicator, 4 oz.